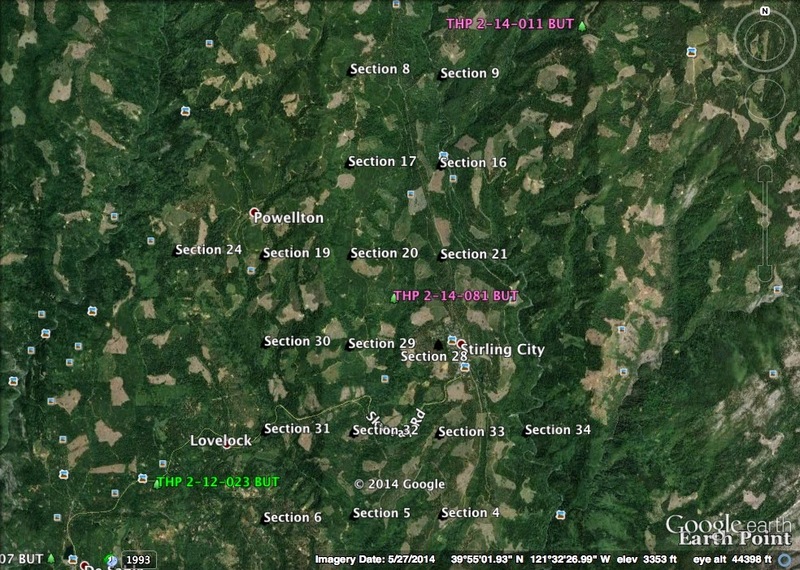 THPBlog: Sierra Pacific Industries to log around the town of Stirling City near Chico. Sierra Pacific Industries to log around the town of Stirling City near Chico. This THP is about 13 miles NE of Chico, CA and adjacent to the town of Stirling City off Skyway Road. The THP is just SW of SPI’s recent Spur THP 2-14-011 BUT that will clearcut on 484 acres (see THP Blog entry “Sierra Pacific Industries to clearcut log on steep and unstable slopes NE of Chico, CA”) near Stirling City and Butte Meadows. Sierra Pacific Industries is planning a tractor and cable logging operation in sugar pine, white fir, Douglas fir, ponderosa pine and incense cedar forests at an elevation of 3,000 to 4,000 feet. SPI wants to use a spur road off of the 130B3 Road within a class I watercourse, a landing within a class I watercourse, and several temporary roads within a watercourse to access culverts. 119 road drainage sites are planned for work including rocking, dip construction and culvert repair and replacement. Butte county morning glory was found in sections 4, 5, 22, 30 and 33. More information is available on the THP Tracking Center website.